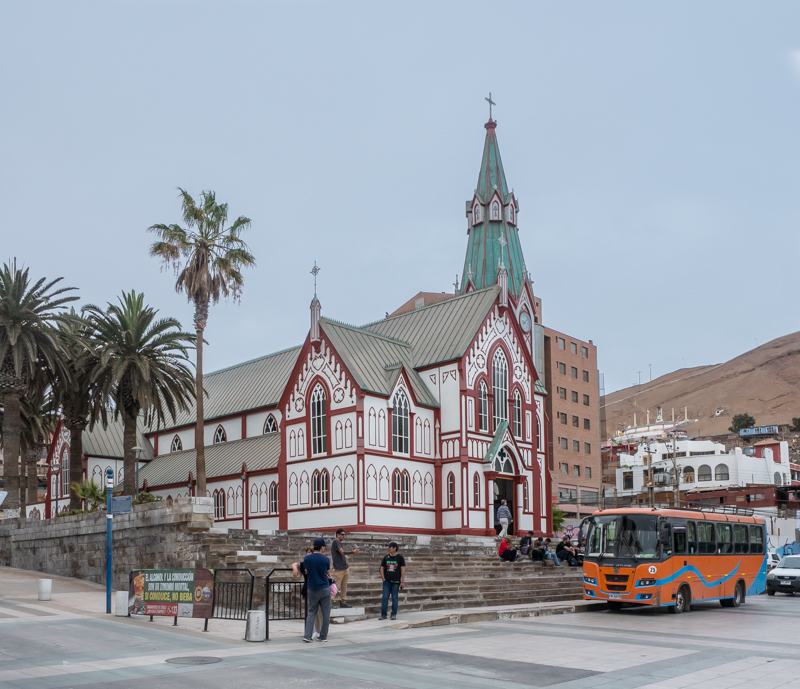 On November 11th, we hired a taxi to take us into Arica since the Don Hugo Campground is in Villa Frontera – a small ‘resort’ area north of Arica approximately 11 km. The ‘resorts’ consist of numerous sandy lots that offer camping. 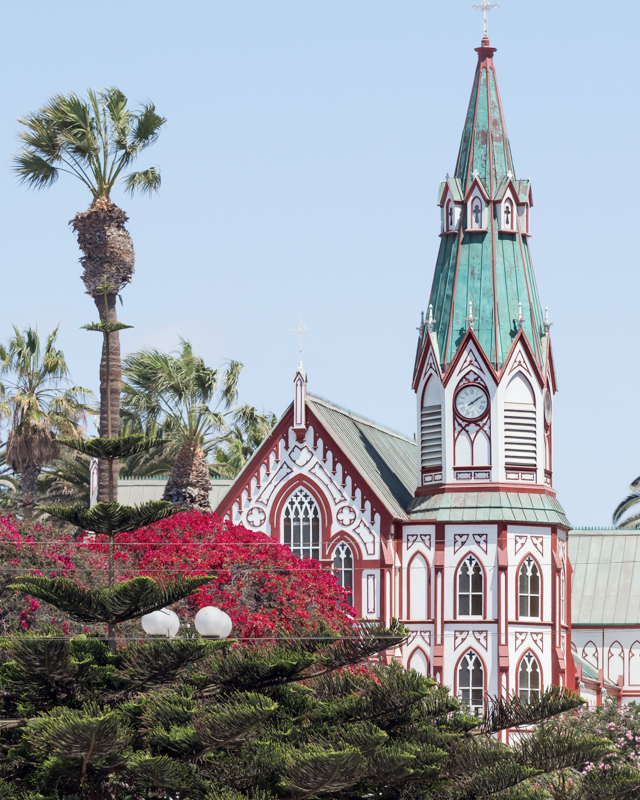 We first went to Arica’s historic center and visited one of the two buildings in Arica attributed to Gustave Eiffel (of Paris Eiffel Tower fame) – the Church of San Marcos. 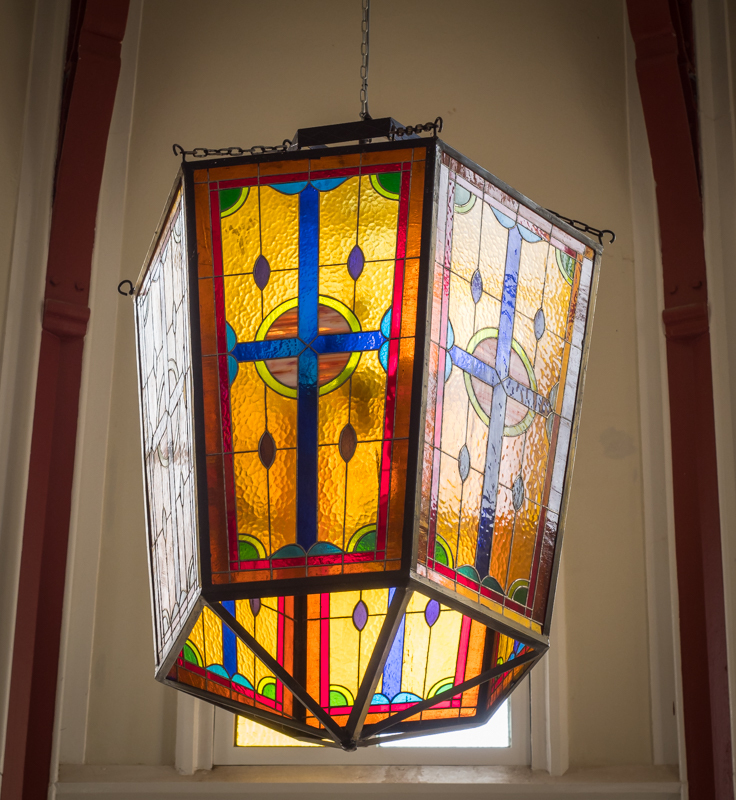 (The other building attributed to him, the Customs House is undergoing renovation and is closed.) 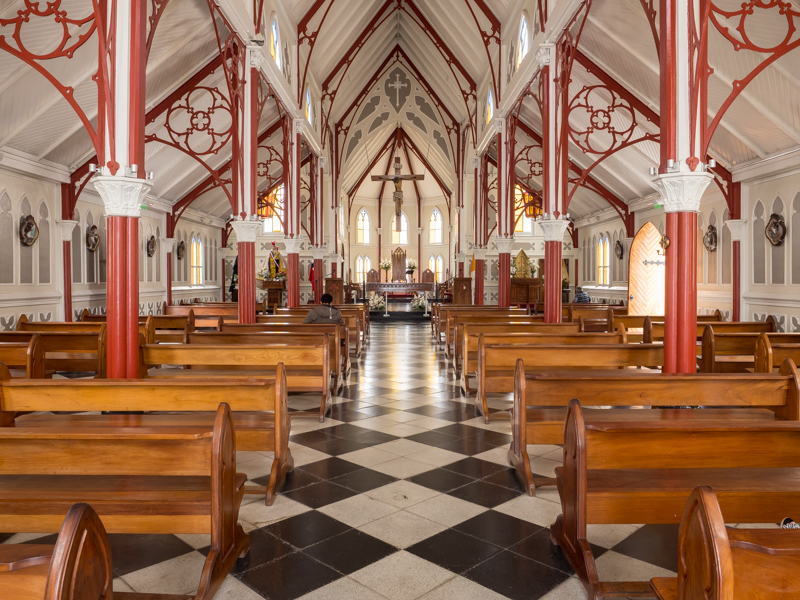 The church is extremely interesting made up entirely of painted metal with a pointed vaulted ceiling. 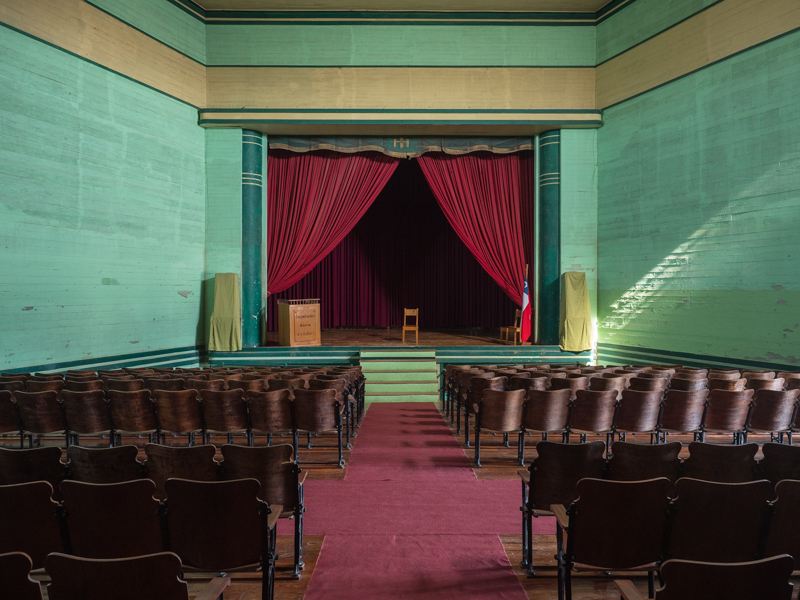 Finding German influenced architecture in Chile didn’t take long. But first we tried to locate the insurance company for the mandated Chilean truck insurance which supposedly was located in the Aduana Office on the Port but everything was closed up since it was a Saturday. 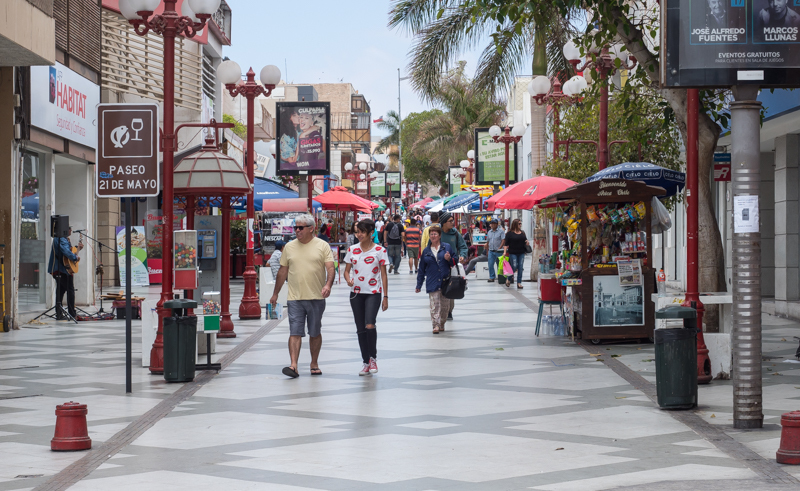 So instead we walked over to the 21st of Mayo Calle which is a blocks long pedestrian-only shopping strip to first get wifi at the McDonald’s and secondly to buy a new telephone SIM card to use in Chile. The 21 de Mayo paseo. 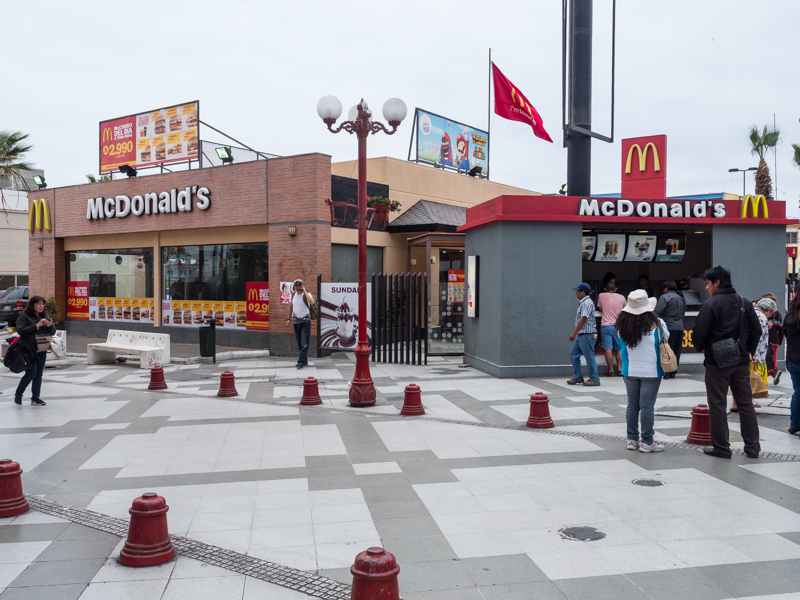 We didn’t expect to see a McDonalds in Arica, Chile. Problem is that Chile changed the rules regarding selling and activating SIM cards Sept. 2017. Now foreigners must register their phone through a third-party certification company with the Chilean governments and the process takes days to register. Of course, none of this information was available when asked of any of the major telephone carriers such as Entel, Claro or Moviestar. Spent hours on Saturday trying to get the SIM card. Then Dave had to spend hours online hunting up the process and for a certification company when he could get a wifi signal. Sunday 12th we hung around campground since we knew offices would be closed. Numerous Chilean families came out to picnic, party and swim on Sunday at our campground so we had lots of company although no one else stayed overnight. On Monday 13th, we took another taxi into town and after several false leads and starts finally located a small hole-in-the-wall store who would sell us truck insurance. And thought we had a lead on getting the SIM card activated but after waiting around for the blocks-wide power outage to be over discovered that company couldn’t do it either. 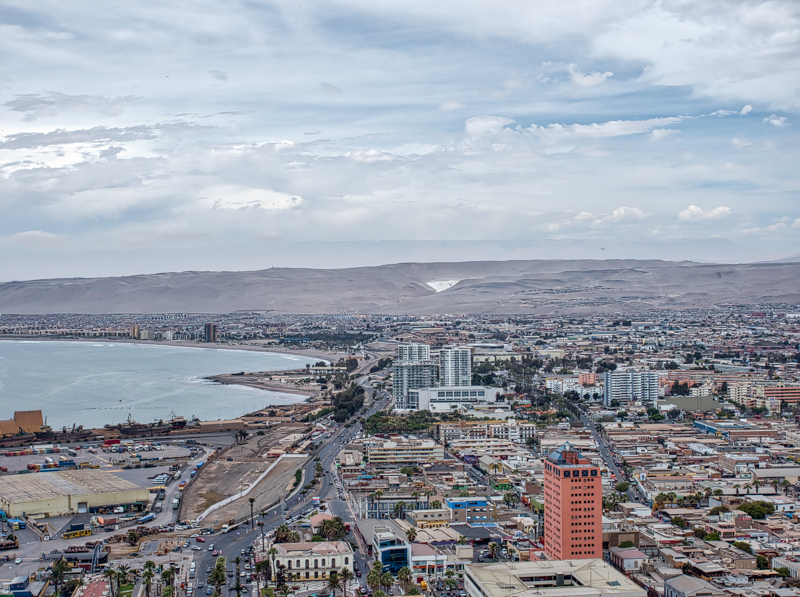 We then hired a taxi to take us up to the overlook at El Morro with a view over Arica. 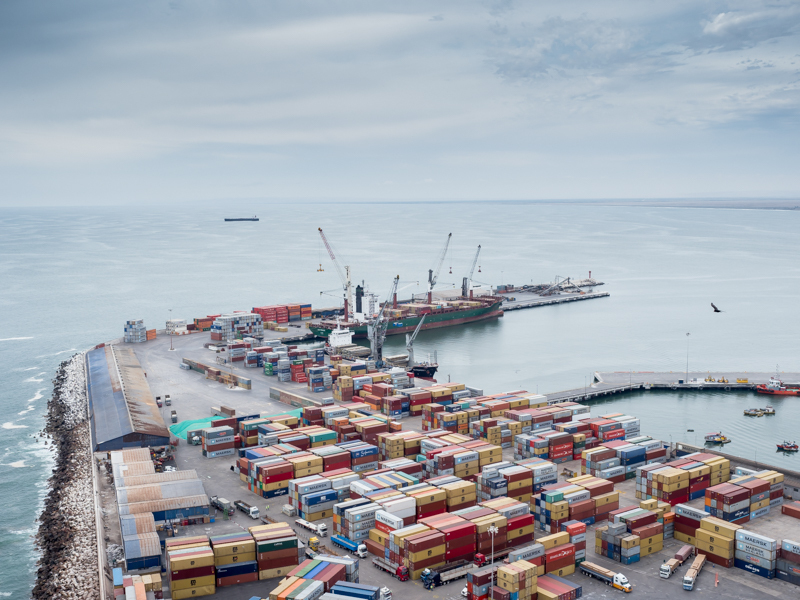 Arica is a big port city with lots of trucks coming down from Bolivia and bringing minerals (we assume) to the port. 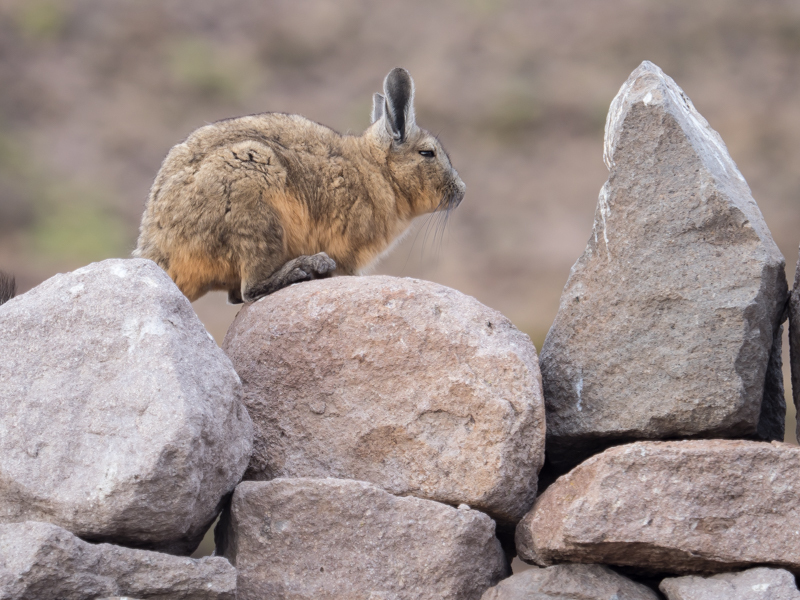 (Additional research indicated that after Peru/Bolivia/Chile settled their border dispute war in the late 1890’s, Bolivia – having lost their ocean access – was granted a untaxed route through Northern Chile to bring their minerals down to Arica’s Port.) Arica also has a major refinery area because we saw hundreds of gasoline tanker trucks parked by roads. With Victor, our taxi driver, for scale. He turned out to be a Pinochet fan. Our taxi driver took us to Unimarc supermarket to stock up and we headed back to Don Hugo’s. 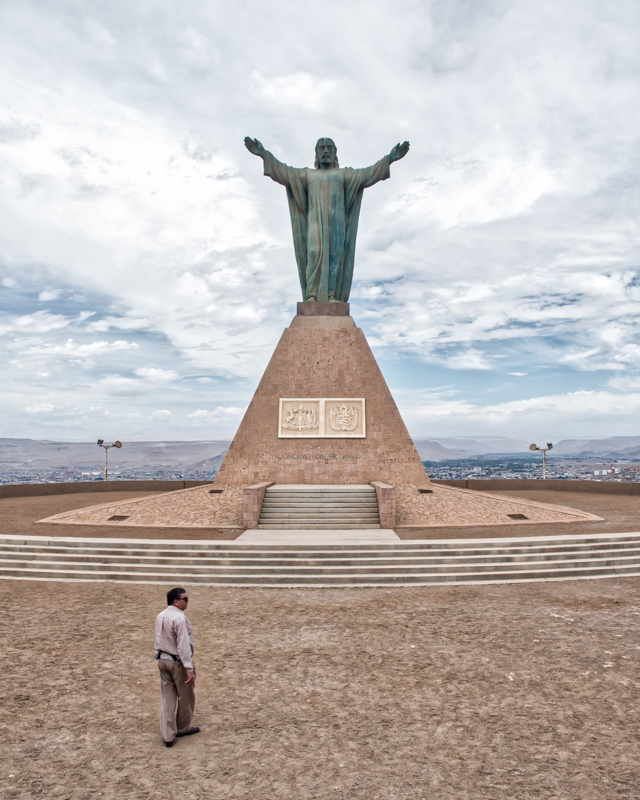 On Nov. 14th we left Arica and headed straight up into the Andes with Putré as our destination at 11,975′. It was to be our launching pad for the next day’s foray into the high Andean lakes. We ended up boondocking on Putré’s plaza which had access to the free Chilean wifi in public places. Nov 15th, we were up and driving by 5:30am and broke our rule of never driving in the dark. 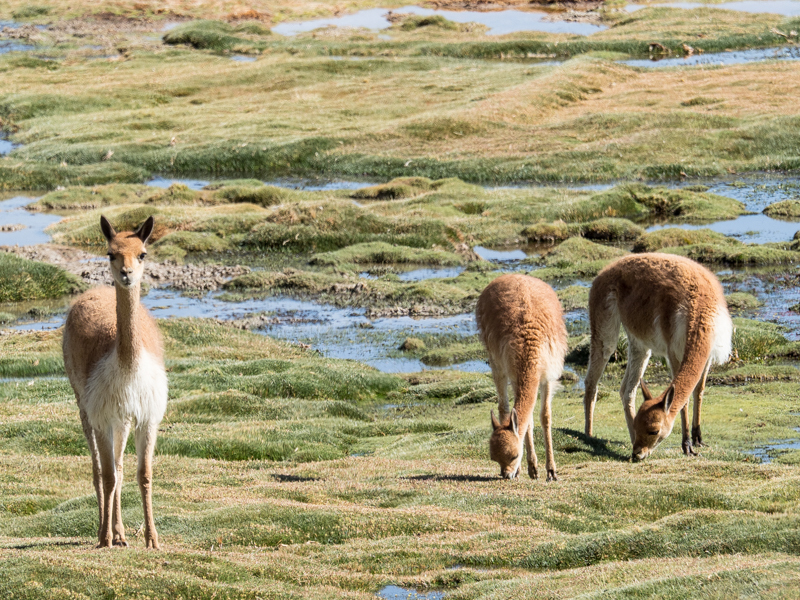 But we wanted to get to Lauca Natl. Park by sunrise. Turned out going up it was good because over the last 10 km. to the Ranger’s Station, there was roadwork underway. 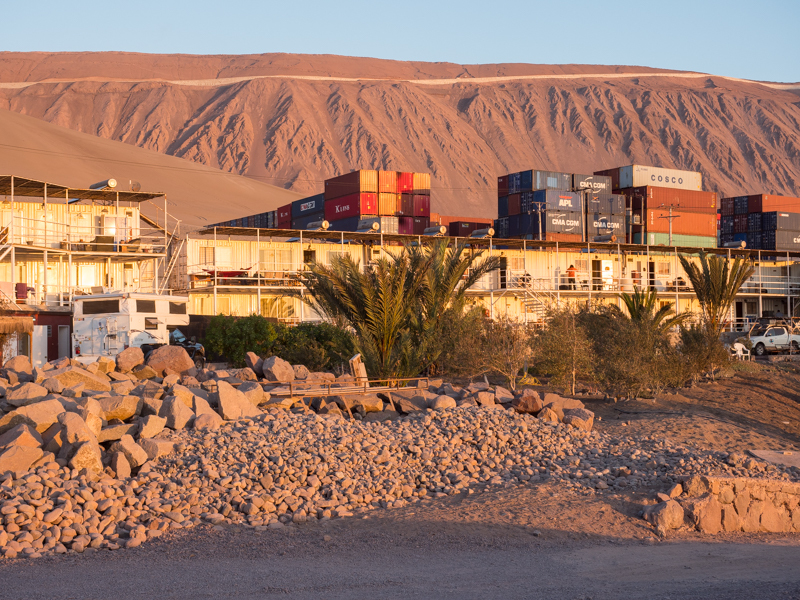 But since we got there before 7am, we could jump to the head of the long line of semi trucks (100 or so) waiting to continue their drive from Arica’s port to Bolivia. The road crew let us through. 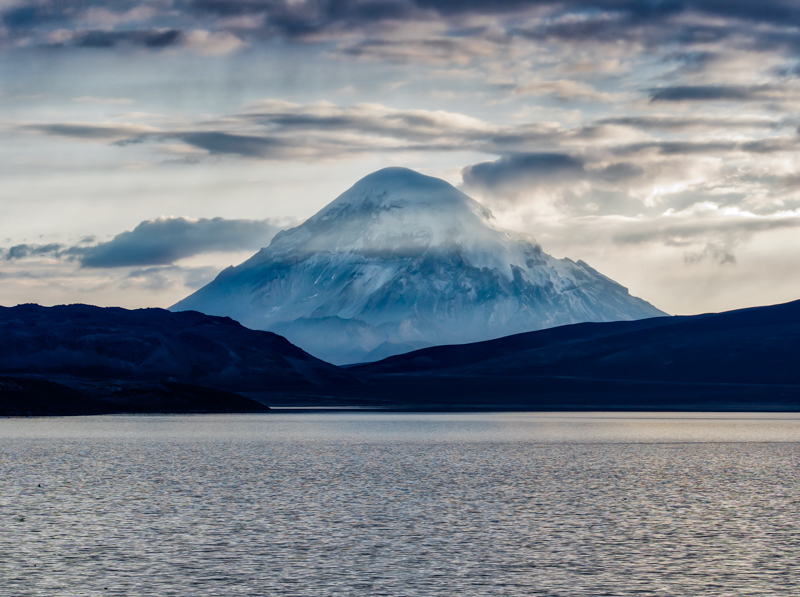 We arrived at Chungará Lake at 15,102’and set up and Dave captured the Lake and Volcán Parincota – maybe his best photo of the whole trip. For sure in the top 10 and in my opinion, National Geographic worthy. 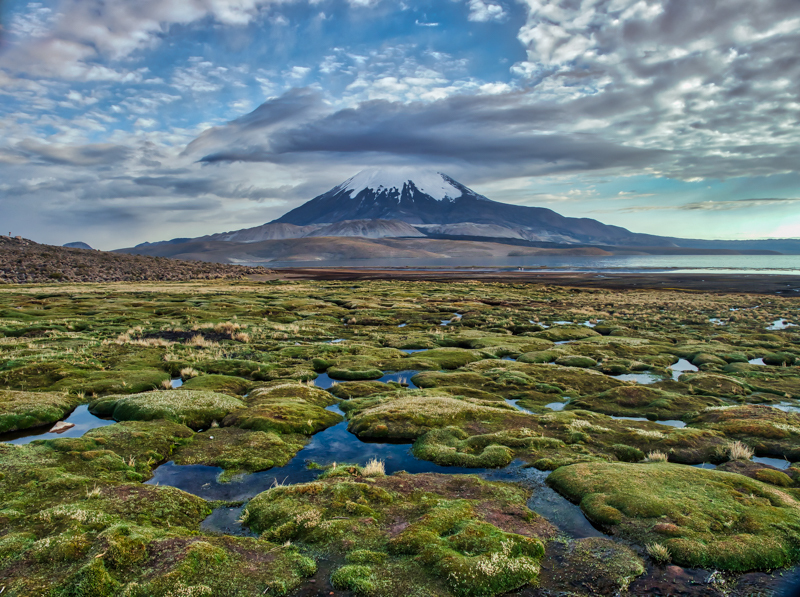 Volcan Parinacota is located near the Bolivian border and Lago Chungará at 15,000 feet. You do not want to mess with this guy. Coming back down was more difficult because road work had commenced and the road crew was letting eastbound semi traffic through approximately 15 semis at a time. But the distance was so far between the ends, we couldn’t tell if there was oncoming traffic or not. More than once, we had to pull into the lane being worked on to let semis coming up the grade through. The biggest delays were when four large semis carrying extremely heavy and wide pieces of equipment met us; each had two semis tractors pulling and creeping, up the gravel inclines. The trailers had ten tires running front to back, duallys – so 40 tires on trailer alone. Dave and I speculated that they were probably carrying some big mining equipment pieces since this area is rife with huge mining operations. 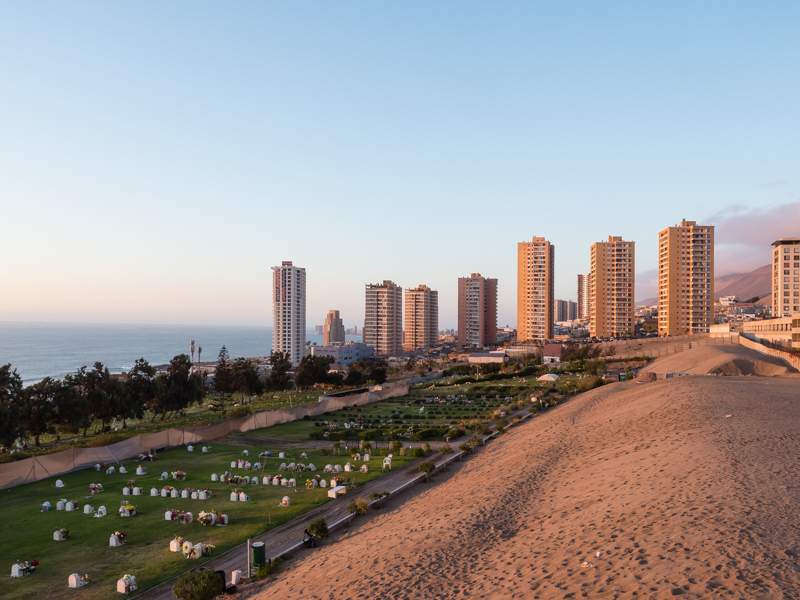 After returning back downhill to Arica, we opted to return to the Don Hugo RV campground in Villa Frontera and head south in the morning. 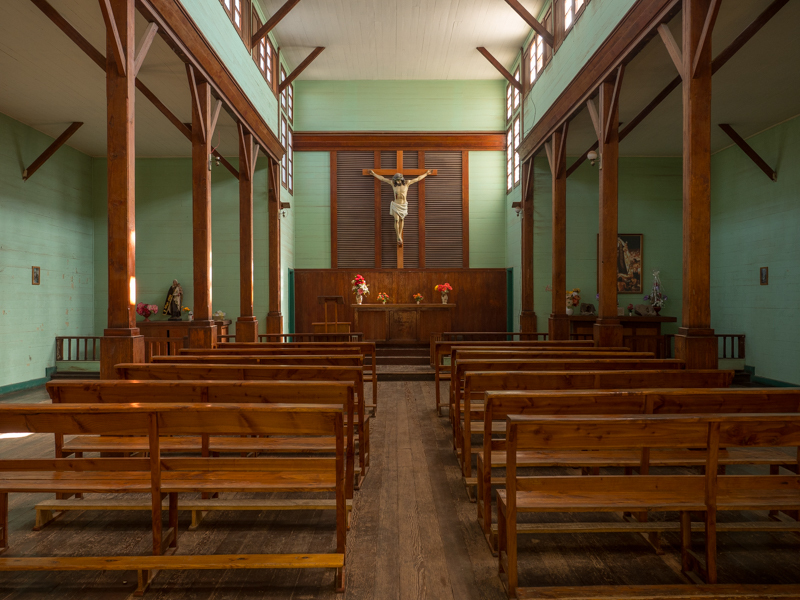 Nov 16th – We left Arica and went up through the verdant Azapa Valley known for its ancient and historic olive growing areas to the Chinchorro Mummy Museum. Interesting gardens and nice museum. After returning to Highway 5 we drove south through the desert. Drove across desert up and down major huge mesas; one had an 18km decline. 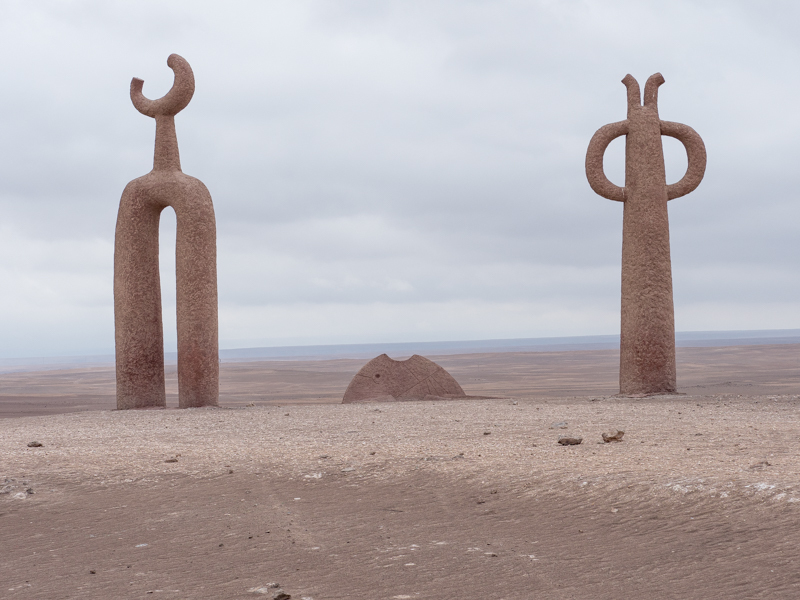 On the way, we stopped for short side trips to the Presencias Tutalares (large stone carvings erected in the 1990’s that symbolize the cosmovision), el Gigante de Atacamba petroglifo, and lastly visited the Humberto Saltpeter ghost town. 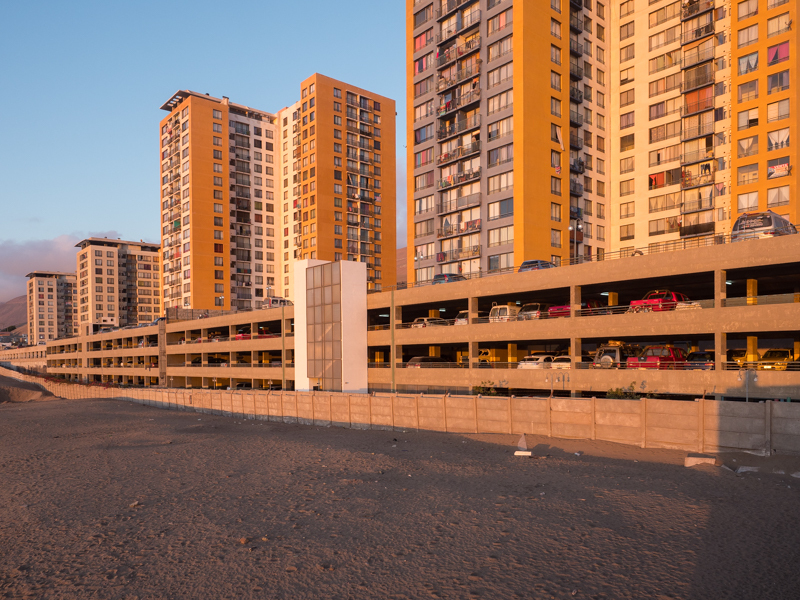 It was super windy and originally we had wanted to boondock in the Humberto parking lot, but decided to press on to Iquique because of high winds. 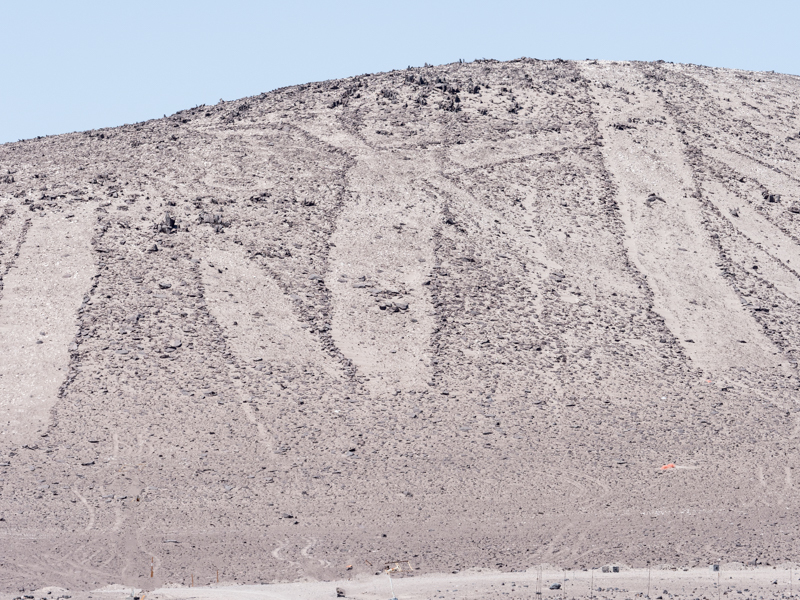 On the drive west on Ch-16, when almost to Iquique there are painted spaced triangles on the roadway to show what speed you should be driving at depending on how many of the triangles you can see in the shoreline fog. What a great idea. Pacifica and Skyline Blvd. in Daly City should incorporate. 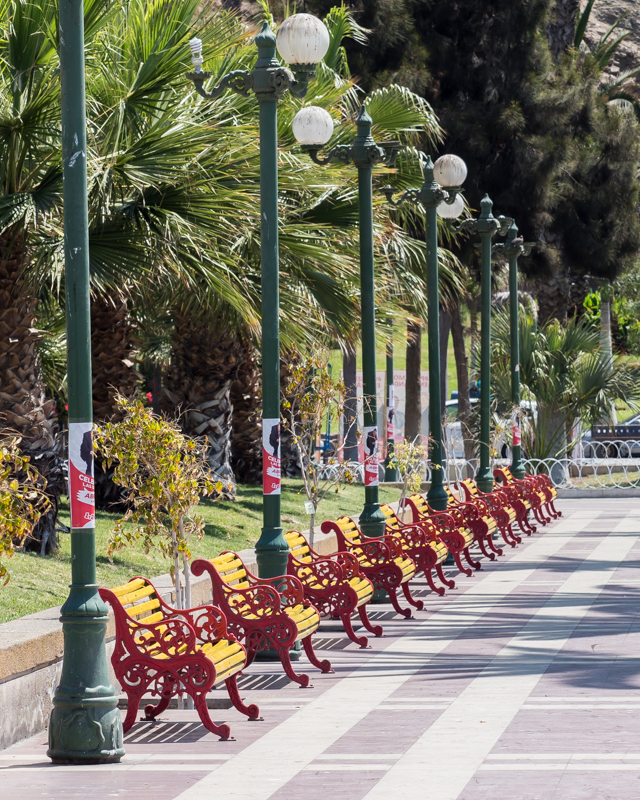 Iquique is unique. 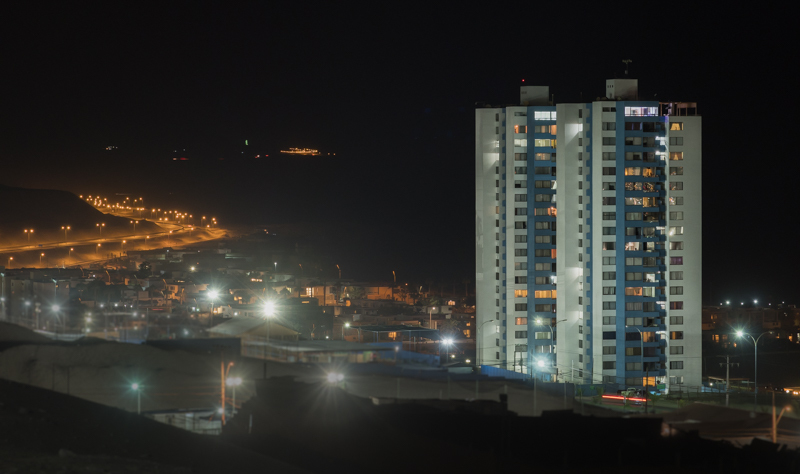 It is a huge modern city at the base of an enormous sand dune – 2000′ high. Looks like Honolulu with all the skyscrapers apartments and condominiums. We stayed at the Altazor Flight School – a Hang gliding school. The hostel area is made totally from shipping containers. Our ‘view’ included to the north the main building section of downtown and to the south the cliffs. Gorgeous weather. Sunny after early morning fog in mid 70’s. A hostel constructed from shipping containers. (Pronounced ee-KEE-kay) View to the north from our campground. View to the south from our campground. 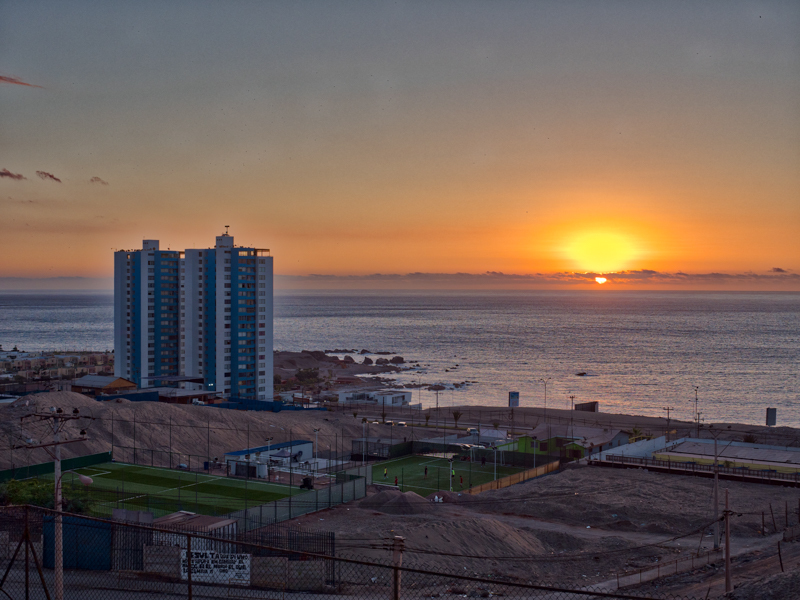 More of our adventures in Iquique in next blog entry.